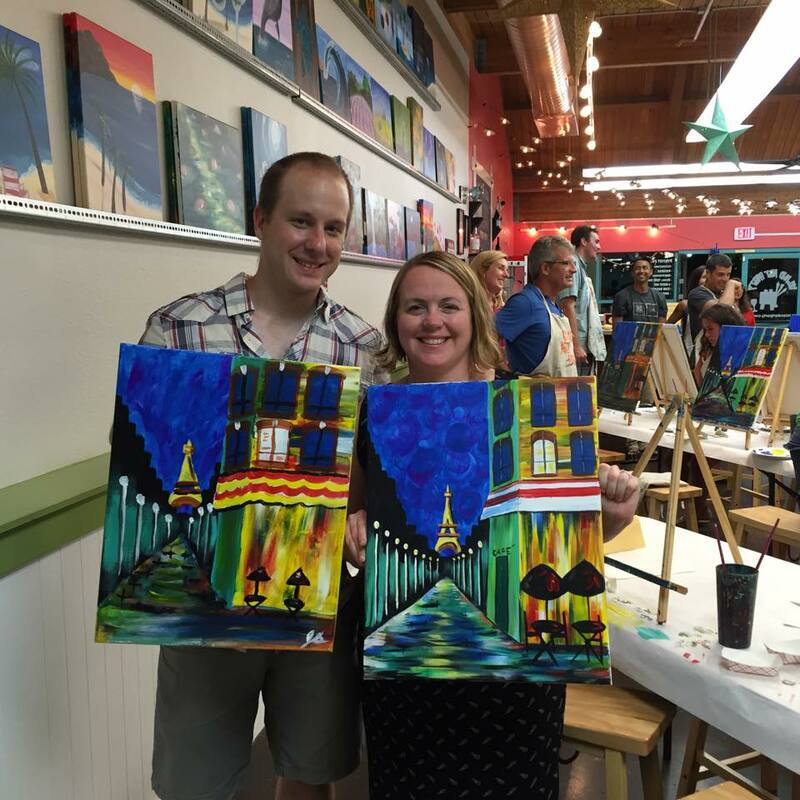 "Mary Silvestri Simmons leads a busy life in Southborough as a wife, mother, artist, member of the Southborough Cultural Arts Council (SCAC), and owner -along with her husband Justin – of a new business, Expressions Art Bar. Although both she and her husband are deaf, it has not prevented them from doing what they love and being a force in the community." It has been a busy year! We welcomed our second son, who will be turning 1 years old in just a month! I also graduated from Plymouth State with a degree in Educational Leadership (Concentration: Arts, Leadership and Learning). While on maternity leave I received an award as the Massachusetts Art Education Association (MAEA) Special Needs Teacher of the Year. In the meantime I was running a part time side business doing Mobile Paint-n-Sip Parties as ARTY PARTY BY MARY. At the end of the school year, I attended a wonderful De'VIA curriculum workshop at CSD-Fremont. It was such an inspiring time to share with like-minded peers. I truly wish I had this group 12 years ago! Just a couple of weeks ago we went on our 5 year anniversary vacation trip | Paint-n-Sip Business Boot Camp in Maui, Hawaii. It was a wonderful experience as we made great new friends, traveled beautiful sights and brainstormed ideas for our new business venture. I am proud to say that we will be opening EXPRESSIONS ART BAR in Southborough, MA by the end of 2015. As soon as I returned from Hawaii, I turned in my letter of resignation and will no longer be a school art teacher. It has been a wonderful journey with this special community and great kids. I am looking forward to our new chapter, becoming a Deaf business owner, spending more time with my beautiful boys, and bringing creative fun to Southborough, Massachusetts. You can find us at www.expressionsartbar.com and keep updated with our progress. Follow us and like us on Social Media: Facebook, Twitter, Instagram and more! We are looking forward to bringing creative fun to Southborough! The 2011/2012 Visual Arts K-12 curriculum focused on the Art of the Pacific. Students learned about the art and culture of Russia, Asia and Oceania. During one particular Dance lesson, our students learned about Deaf dancers in China and were inspired by "Thousand Hand - Guan Yin." Their "Thousand Hand" dance choreography was performed by Deaf dancers of China Disabled People's Performing Art Troupe. 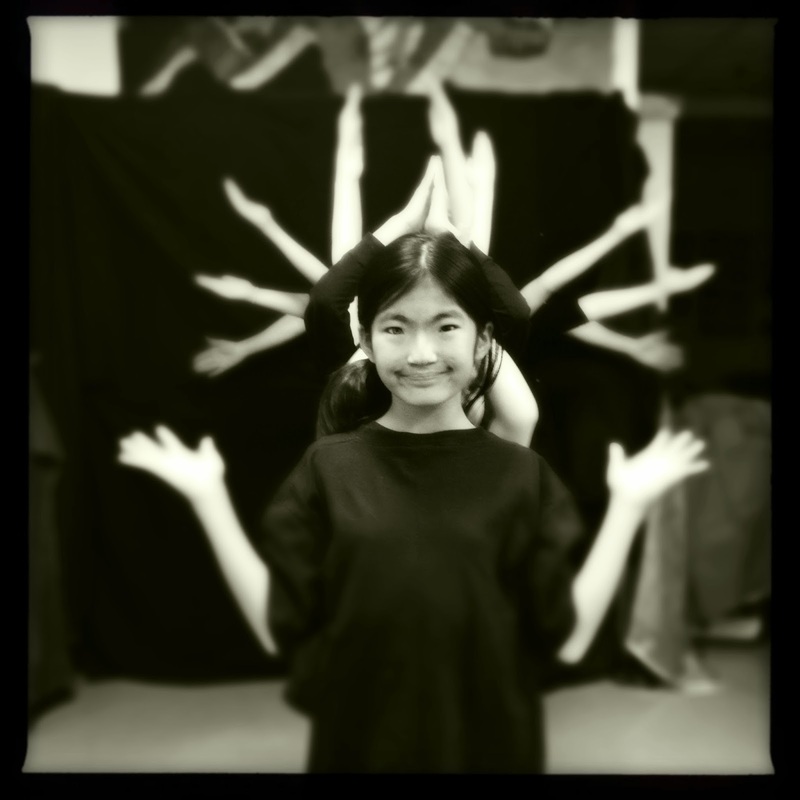 TLC students then created their interpretation and designed their own movement choreography. The video was edited by the art teacher, Mary Silvestri Simmons. Slideshow from the TLC's Annual Art Show 2013 "Art of the Pacific" (May 2013) can be viewed on TLC's website here. It has been a quite a while since I've posted, but life has been busy and wonderful. This year I have a new classroom for my Secondary classes. It seemed like it would have been a challenge to shuttle back and forth between two buildings but I am enjoying the school year so far. The new secondary art room has more of a studio feel and is appropriate for older students. I hope to post more articles soon but for now, here are some updates from our program. Students will learn about the traditional and contemporary arts and cultures from various countries from India to the Middle East and Africa. They will learn about Safari animals. Our students had artwork on display at the Boston Center for the Arts as part of Deaf Awareness Week (Sept. 22-28). The artwork included projects from their De'VIA Unit; Deaf Eyes and Primal Hands. 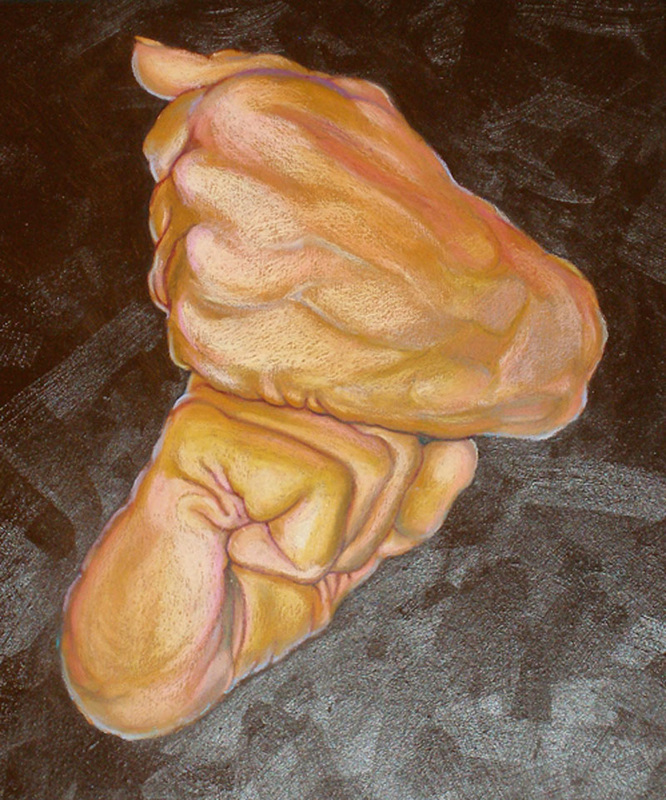 Primal Hands was inspired by a Deaf Artist named Nancy Rourke. Art classroom updates, projects and news are often updated on our classroom twitter. 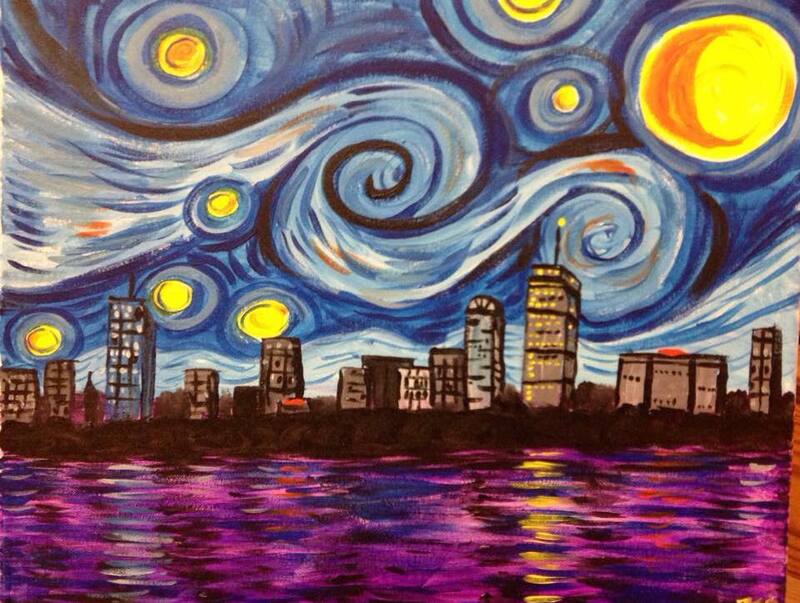 Please follow the art teacher at @MSimmonsTLC to stay in the loop! I am currently in my second year as a CAGS student at Plymouth State University. As part of my Graduate Practicum I am helping with the After School Program. This fall we are offering Ceramics, Academic Support and CrossFit. Potential clubs to be offered in the winter/spring may include Drama, Yoga, Zumba, Science, Arts & Crafts, Youth Leadership and more. I will also have one of my watercolor paintings, Seashells I, on display at the MAEA Conference exhibit this November. "Signs are to eyes what words are to ears." Today is Monday, December 17th, a brand new day. I came into my classroom prepared to be there for my students. Newtown is next to my hometown in Connecticut and I know people who are grieving and processing still. As I hold my son tighter, and work with my students, my thoughts are with the families and the community in Newtown and I hope they work together and help each other heal. As an art teacher, what can I do? Art is often a tool for inspiration, creativity, fun, and beauty. Art is often used as healing. I had a Kindergarten art class today. Instead of letting myself be stricken with grief, I found myself working hard to be stronger, positive and forging ahead. It will not be easy for many of us and we will all recover differently. Those teachers in Newtown were heroes as they thought of their students first and showed their love and compassion no matter what. I still believe we can all make a difference. What will you do in your classroom to prepare our students for the future and process their healing? This post below is part of my healing process. "And we learn that our most important job is to give them what they need to become self-reliant and capable and resilient, ready to face the world without fear. This is our first task -- caring for our children. It’s our first job. If we don’t get that right, we don’t get anything right. That’s how, as a society, we will be judged. " Earlier in the year our High School art class kicked off the curriculum studying Russian Art, and Marc Chagall. 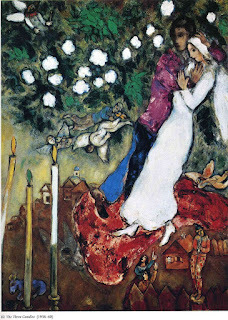 We learned about Chagall's difficult life and his purpose as an artist to heal and promote peace. 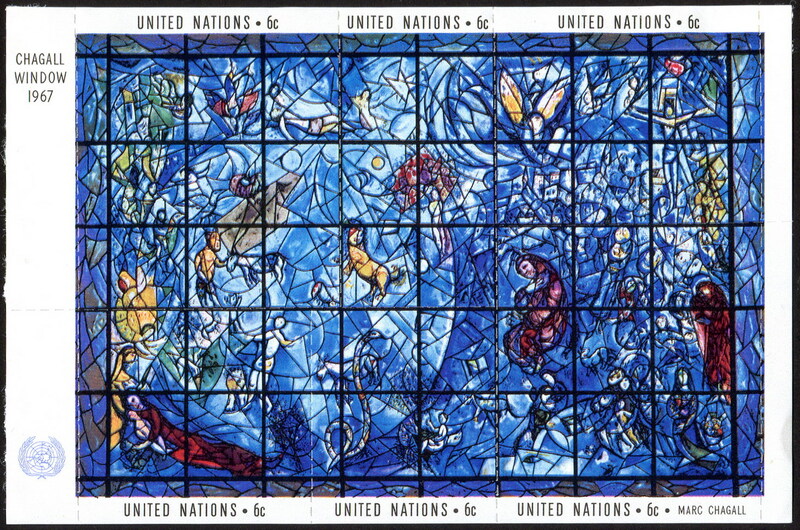 He also began working with stained glass late in his life and one particular piece our classes studied was his Peace Window. My classroom has a smartboard/LCD projector so I was able to display the Peace Window onto the board, and turn off the lights in the classroom. The effect was powerful. Students were amazed by the serenity and the chills that came about, and discussed their reactions to the artwork. Students discussed how art can be healing for both the artist and his audience. Students created their own symbolic imagery of what brings them peace and designed a faux stained glass window. 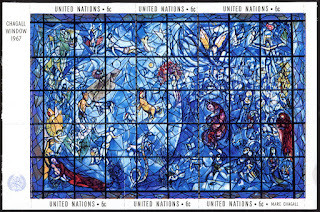 An example of a lesson plan using Chagall's Peace Window can be found here. Chuck Baird suffered from cancer at the end of his life and it had a profound impact on his later artwork. He concentrated on the beauty of life and the light within. K-12 students created a design for our school yearbook incorporating ASL art in honor of Chuck Baird. More about Chuck Baird's work can be found here. Community is an important part of our school's belief system. 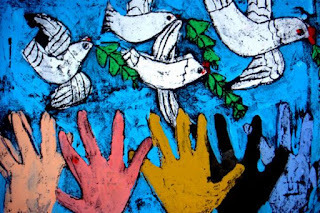 It is a time for us to come together and support one another. Our Executive Director sent us a school wide e-mail reminding us to be there for our students, support them as needed and know that our school counselors are available to support them. After school today, we will have a staff meeting so we can support each other as well. More about our school and its core values can be found here. Art has been used as a form of communication and expression for as long as man has been around. Artists and their artwork can inspire themselves and others to begin the healing process. Art Therapy is an example of how art can help people recover. Today some of my students simply became relaxed by working on their art projects. One student made a card to the "20 Angels" before returning to her art project. Over the past year we have lost two beautiful Deaf artists who also were pioneers in the De'VIA movement. De'VIA is short for Deaf View/Image Art. 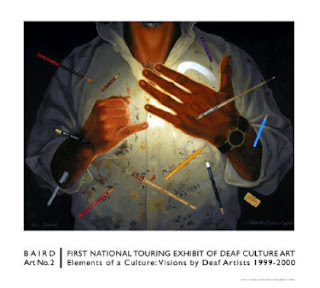 This movement was officially recognized at the Deaf Way Festival at Gallaudet University in 1989. CHUCK BAIRD - (1947-2012) Chuck Baird shared a special relationship with our school here at The Learning Center for the Deaf. He was an Artist-in-Residence here in 1995 and completed a mural in our cafeteria that shows the rich history of ASL (American Sign Language). Our ASL department created a video explaining the history and can be found on youtube. During an interview Chuck Baird mentioned that his research on ASL during this project had a profound impact on him. More from this interview can be read here. 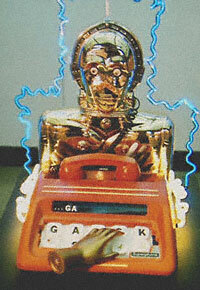 I personally met Chuck Baird in 2002 when I was living in the graduate student dorm at Gallaudet University. I was hosting a dorm event with my roommate who was an RA. I set up an art exhibition and reception in the lobby and Chuck Baird came to participate as he was living in the dorm as well. He did a live demonstration of his artwork and that piece was exhibited during the Deaf Way II festival. Chuck Baird and I became friendly and he invited me to participate on the committe for Deaf Way II. I immensely enjoyed my experience meeting international Deaf artists, and planning for the Artist Seminar and creating a docent guide. I am forever grateful to Chuck Baird for this invaluable and inspiring experience. 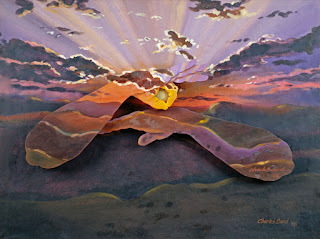 More about Chuck Baird's art can be found here. Dr. BETTY G. MILLER -(1934? - 2012) I also met Betty Miller at the Deaf Way II festival and I vividly remember her collaborative neon art projects with other artists. Betty Miller is considered the Mother of De'VIA and led the workshop that created the De'VIA manifesto. 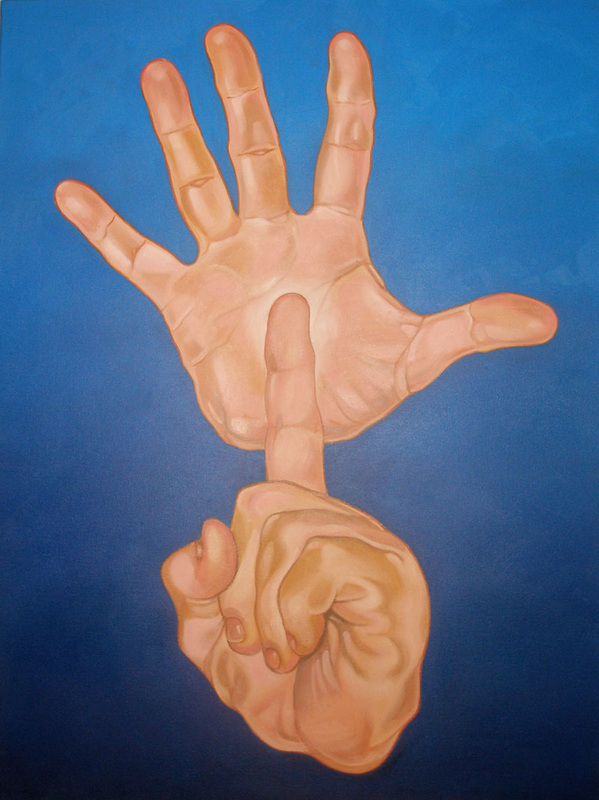 While Chuck Baird's artwork shows the connection of ASL with imagery, Betty's work shows her personal experience as a minority and memories of oppression. Chuck Baird noted that Betty Miller was ahead of her time and called her the first artist to express Deaf experiences in her work. More about his thoughts on Betty Miller can be found here. More about Betty's work can be found here, here and here. 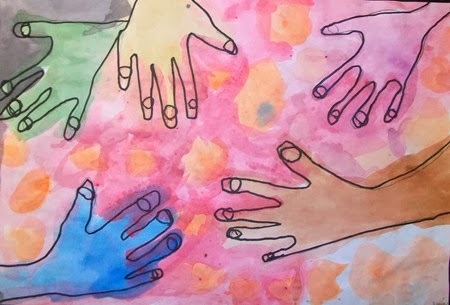 Every year our students here at TLC participate in the Marie J. Philip ASL & Art Competition and often their artwork is inspired by Chuck Baird & Betty Miller. See more information here. Just last year our students had an art exhibition at Tenacre School in Wellesley titled "Deaf Eyes." This exhibition was a culmination of our studies of De'VIA and students' self expression of their Deaf Culture identity. More of TLC student work can be found at artsonia.com/learning10 and some of their De'VIA work can be found here or here. 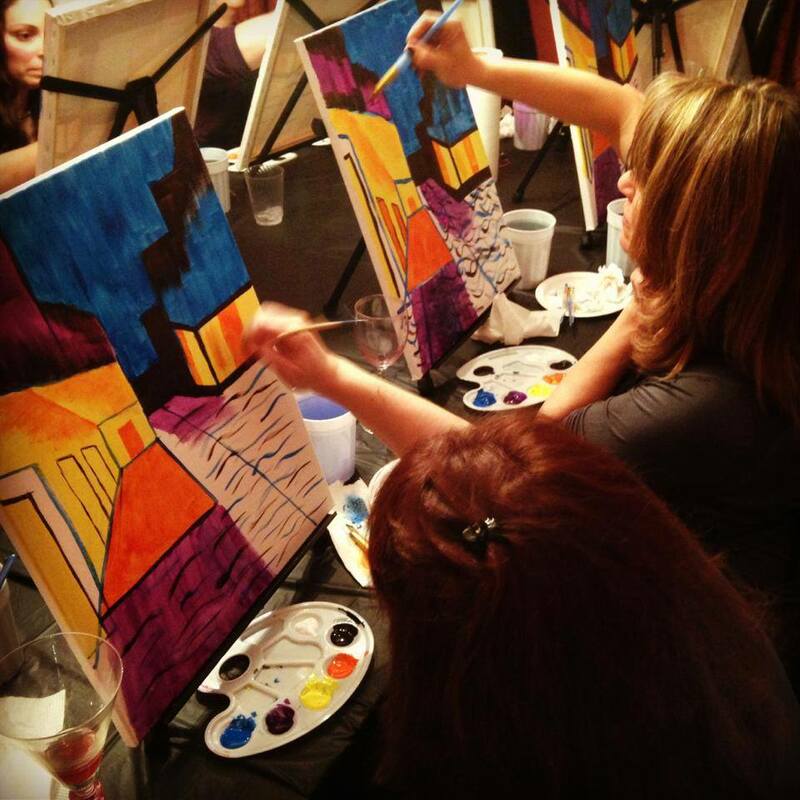 Select one of these paintings for your private party! 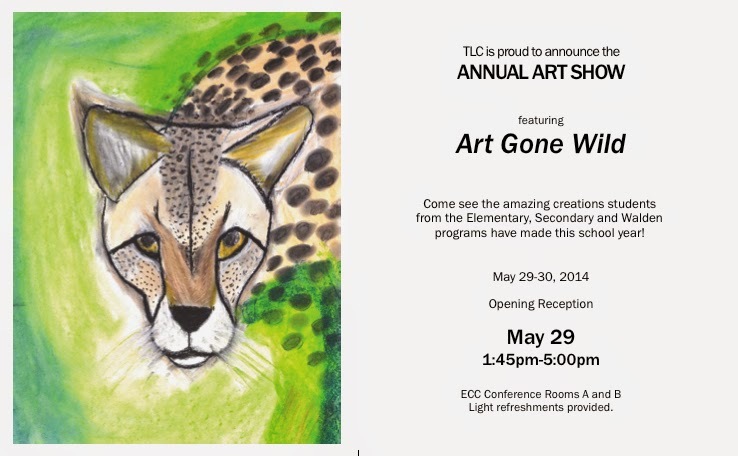 TLC's Online Art Gallery that promotes Literacy and Addresses the Common Core. Our art program also earns 20% when parents/guardians purchase keepsakes with their child's artwork. Established in 1970, the mission of The Learning Center for the Deaf is to ensure that deaf and hard of hearing students achieve their full potential in an educational environment where language and communication are keys to building competence, character and community.